This topic shows you how to find a member or family in your organization's pictorial directory. The directory is available only if your church enables the feature. A member's telephone number, email address, address, and photo appear in Pictorial Directory only if the respective options to publish this information are checked in the family's profile. For details, see Options_to_Publish_Personal_Information. In the Last Name, First Name, or in both name fields, type the name of the family or individual you are looking for. In the Search list, select Members to search the directory for members or select Families to search for families. The page updates, and the names of the member or family matching your search criteria is displayed. If the member or family gave the church permission to publish a photo and personal contact information, that information is visible. 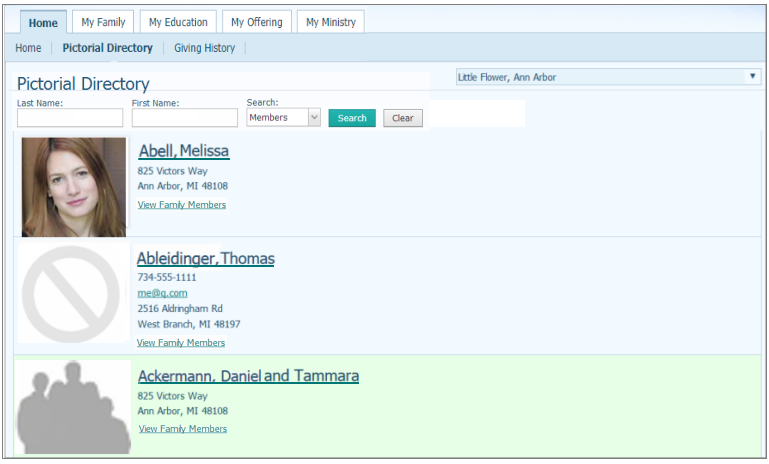 To view individual family member names and photos (if available), click the View Family link.